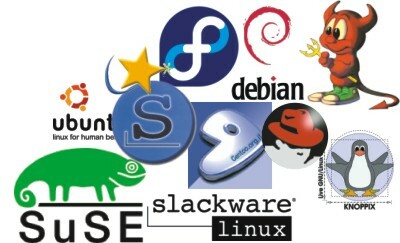 Linux is one of the most successful and biggest open source project. It has grown and matured a lot since these two decades thanks to the efforts of numerous talented programmers who contributed to this project. One of the biggest plus point of Linux according to me is its wide hardware support and its ability to dwell into any computing environment. There are other UNIX reimplementation like Linux. FreeBSD and solaris are among few of the popular ones. Linux is just the kernel which can also be referred as the core. The kernel alone will not be of much use to the users. Distro vendors add clothes to flavor up the Linux kernel with essential software, commands, drivers, etc in different ways to suit the end-users. There are numerous distros targeted for different user groups. Its Free – This is the first reason I give when someone asks me why i use Linux. Almost all Linux distributions are free of cost. This is a major reason why anyone should use Linux unless you do something in Windows which is not possible in Linux (there are VERY few such things) or if you love paying for things that can be done for free. Its open source – It means that the source code of Linux is open to all. Some people will say it as a disadvantage as people will be able to exploit the loopholes visible through the source code. This is a stupid statement as the loophole/bug is visible to all and many programmers come forward to patch it as soon as it is discovered/reported. Its always up-to-date – Linux is maintained by the open source community and is regularly updated according to the current technology. Thus, Linux is always equipped and compatible with bleeding edge technologies and at the same time equipped with latest security patches. On an average, a new Linux kernel update comes out every couple of months. Live CD – Most Linux Distros have a Live CD which you can use to boot the entire Linux Distro from CD without touching your hard drive. It is a good practice to use a Live CD to try a distro before installing. You can also boot a Live CD image through USB flash drives. Flexibility, stability and efficiency – Linux is Flexible and can be molded for any usage . It can be changed to run in supercomputers (8 of top 10 supercomputers run on Linux), embedded devices or anything else (like on a computer with 2MB RAM). Android, which is emerging as a leading OS for smartphones, is based on Linux (modified Linux kernel). Similar examples are MeeGo and Maemo. Linux is a very stable OS. It hardly crashes as the application runs in layers and don’t cause problems with the kernel. Servers running Linux stay for years without any downtime. As a matter of fact, 80% of world’s servers run on LINUX. Some popular softwares not for Linux – Some of the popular softwares like Photoshop, MS office, etc is not designed for Linux and some find their Linux alternatives not up to mark. Although there are ways to run these windows based softwares on Linux (using WINE), it doesn’t guarantee stability and support. Not many good games – This is one of the most disappointing thing about Linux. There aren’t enough good games made for it. Most leading game developers make games for Windows. Although there are few nice games for Linux that might satisfy a casual gamer, a heavy gamer or someone looking forward for some games with breathtaking graphics or some popular titles would want to have a Windows installed along with LINUX. Some simple tasks sometimes become complex – Although the Linux Distros and desktop environments are very user-friendly, there are times when they don’t work the way you want and you need to go back to the terminal (command line). 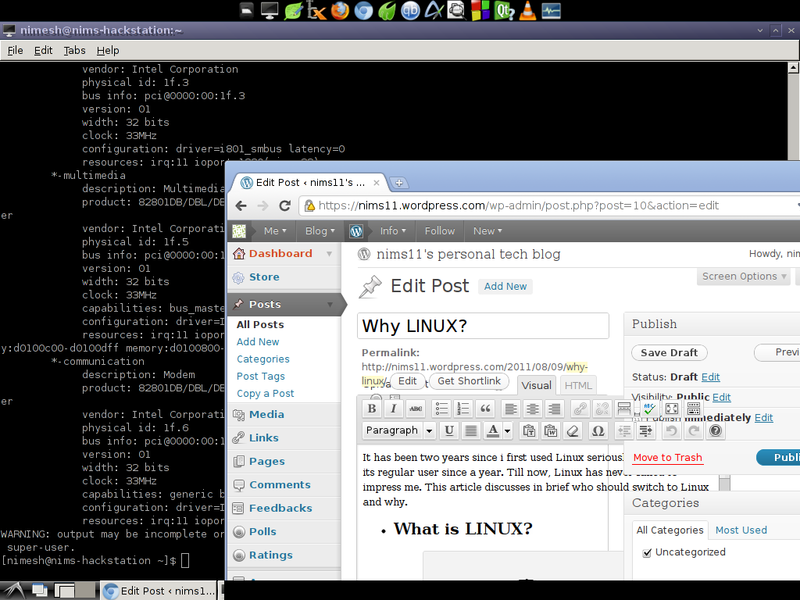 I usually face problems with lightweight distros which does not detect all my partitions and add their entry to fstab. I have to mount them through terminal or manually add its entry to fstab. Installing software can also be troublesome for new users under some distros. Doing things through terminal might seem complex at first (I think its fun! ), but new users get used to it in a couple of months. However, on the process of doing these things, you always learn something about how Linux works and how it does something. Its possible to run Windows executable files (*.exe) in Linux using WINE. It supports wide variety windows apps and games like MS office, photoshop, counter strike, mass effect 2, etc. For list of tested applications, click here. Although i prefer to use open source alternatives for popular Windows softwares, WINE often proves as an essential tool when i want to run some Windows app or play some good games. Wine too has its own sets of issue while running windows programs. So its better to check the compatible apps list in its website. Ubuntu – It is the most popular Linux Distro according to distrowatch.com. It is a perfect distro for both beginner and advanced users. It comes with a Wubi installer which installs Ubuntu from Windows to run just like any Windows application. It saves you from doing the partitioning by creating a disk image inside a pre-existing partition. Although i discourage installation through Wubi as Ubuntu installed this way doesn’t support hibernation and the installation is less stable as it becomes dependent on the stability of the windows drive. But new users can use this method to get a taste of Linux and then go try installing it the way it was intended to. You can also try Kubuntu which is just Ubuntu with KDE graphical environment instead of GNOME. Linux Mint – It is an Ubuntu based Distro that makes thing easy for new users. Most new users get annoyed when they cannot play their favorite music as the mp3 codecs are missing after installation of many distros. Linux Mint comes with most codecs pre-installed which helps new users feel like home. I personally recommend this distro to new users. Mint was my first Linux Distro after i got seriously into Linux and I used it for about 6 months before switching to Arch Linux. Fedora – It is a Red Hat sponsored project and a very popular Distro out there. It’s always in line with latest technology and its RPM packages support make easier to install softwares. Arch Linux – My current Distro, Arch Linux is a flexible and simple distro that allows user to customize it according to what they need. Although the customization process is pretty lengthy and can take a whole day, you end up with a very efficient distro which only has features you want. The best part while using Arch Linux is that you learn a lot about how Linux works. This Distro is not recommended for beginners and should be used by those who have some Linux experience. I recommend the beginners to use any of the distro listed above Arch Linux and then try Arch after few months. An excellent guide on Arch Linux installation , here. Also go through the beginner’s guide in the Arch Linux Wiki in its through its official website. Puppy Linux – Puppy Linux is an example of Linux’s flexibility. This 128MB distro that can run from CD, USB or hard drive is a great Linux Distro for lower-end computers. It has all basic functions that an OS should perform and thus can be used to breath life into an old PC. This entry was posted in CodeProject, Linux and FLOSS and tagged Linux and FLOSS, open source, operating system, UNIX on August 13, 2011 by nims11. cover the same topics talked about here? I’d really like to be a part of online community where I can get suggestions from other experienced people that share the same interest. If you have any suggestions, please let me know. Kudos! There are many online communities related to Linux and Open source. To start with, just join up the official forum of the distro you are using.